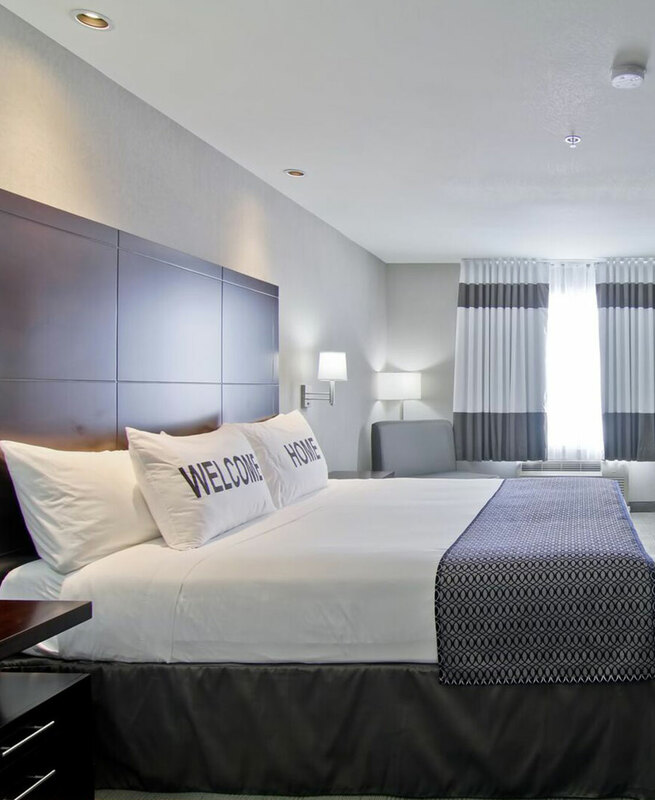 Home Inn & Suites - Regina Airport features 98 beautifully appointed rooms, with luxury finishings and decor. The hotel is 100 per cent smoke free and every room features an impressive list of amenities to make your stay with us comfortable and memorable. With several room configurations to choose from, our hotel is perfect for extended stays. We are also pleased to offer wheelchair accessible rooms. For more information on these rooms, please contact us prior to booking. Book your room with us using our secure online registration system and get the best rate for your stay. Perfect for families, this room features two Queen beds with Signature d3hDream linens and soft duvets. The room is furnished with a mini-fridge, microwave, a 42” TV and a large work desk to maximize your living space, and also comes with a Keurig K-pod coffee maker, hair dryer, iron and ironing board. Free wireless and wired high-speed Internet are also included. Great for families who want all the comforts of home, this suite features a space-saving kitchenette with a full refrigerator, a microwave, a ceramic cooktop, a granite eating area/workstation and a Keurig K-pod coffee maker. The room is furnished with two Queen beds with Signature d3hDream linens and soft duvets, and features a 42” TV, a hair dryer, iron and ironing board. Free wireless and wired high-speed Internet are also included. Perfect for couples or business travellers, this spacious guest room features one King bed with Signature d3hDream linens and soft duvets, as well as a 42” TV, a larger work desk with ergonomic chair, a mini-fridge and a microwave. The room includes a Keurig K-pod coffee maker, a hairdryer, an iron and ironing board, and free wireless and wired high-speed Internet. This remarkable suite is designed with families and business guests in mind. The bedroom features two Queen beds with Signature d3hDream linens and soft duvets, as well as a large work desk with an ergonomic chair. The separate sitting room features a 42” TV and pull-out sofa, a mini-kitchenette with small sink, mini-fridge, microwave and and a Keurig K-pod coffee maker. This room also includes a hairdryer, an iron and ironing board, and free wireless and wired high-speed Internet. You’re in for a treat in this spacious suite, featuring a semi-private bedroom with one King bed draped in Signature d3hDream linens and a soft duvet, as well as a sitting area with a two-person Jacuzzi, a fireplace, a 42” TV and a pull-out sofa. This room also features a large work desk with ergonomic chair, mini-fridge, microwave and and a Keurig K-pod coffee maker, as well as a hairdryer, an iron and ironing board, and free wireless and wired high-speed Internet. 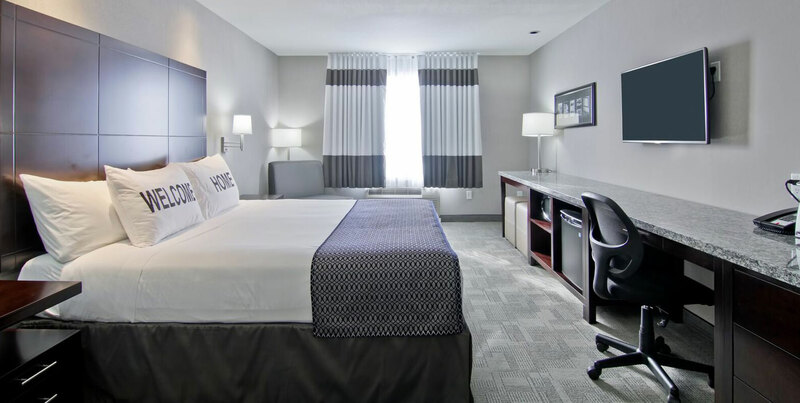 A partnership between the Saskatchewan Science Centre and the Home Inn & Suites - Regina Airport, this theme room features an underwater-inspired living room with a Queen pull-out sectional, a fish tank coffee table and colourful wall displays. Parents can escape to their own room, which features one King bed with a six foot-tall glowing moon headboard, a telescope and twinkling stars on the walls. Go deep underground to the children’s own separate room, with twin bunk beds, a leaf ceiling and roots on the walls. The Saskatchewan Science Center graciously supplied fun, interactive and educational wall panels for each theme to keep children, and adults, occupied. This suite also comes with a 42” TV and gaming system, hairdryer, iron, ironing board and Signature d3hDream linens. The ultimate in luxury, this beautifully appointed signature suite is spacious and inviting, with an open concept feel. The semi-private bedroom features one King bed with Signature d3hDream linens and a soft duvet as well as a 42” TV, while the separate living area boasts a sofa bed, cozy fireplace and another 42” TV. This suite also features a full kitchen, with a stove top, dishwasher, sinks, full refrigerator, microwave, oven, dining area with countertops and bar stools, and a Keurig K-pod coffee maker. This gorgeous suite includes a hairdryer, an iron and ironing board, and free wireless and wired high-speed Internet.